Turkey will invest €39 billion ($46.4 billion) on railways in the next five years, the transport minister said Tuesday. In the last 15 years, Turkey has invested €18.5 billion ($25 billion) on its railways, including high-speed trains, he added. He added that a 1,213-kilometer (753.7-mile) high-speed railway line was in operation in Turkey. The minister said high-speed trains serve 33 percent of the country’s population in seven cities. “Turkey is the second-largest country after China in railway constructions. Our target is to complete 11,700 kilometers (7,270 miles) of high-speed railway lines until 2023 and to link 41 cities to each other,” said Arslan. Isa Apaydın, director general of the Turkish State Railways (TCDD), said there are 41,000 kilometers (nearly 25,500 miles) of high-speed railway lines in the world and the figure will nearly double in the coming years. “High-speed trains are the motor power of the Industry 4.0, they provide productivity for all areas,” he said. Renato Mazzoncini, the president of the International Union of Railways (UIC), said 1.6 billion passengers use high-speed trains annually. “These trains not only change tourism and economy, they also change people’s lifestyle,” he added. 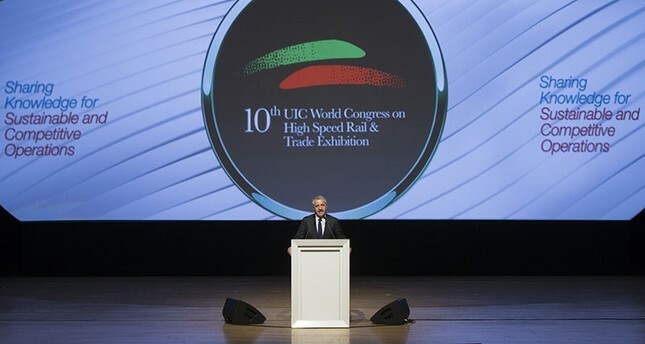 The congress, organized by the UIC and TCDD under the patronage of the prime ministry, will end on Friday.